One thousand miles is a long journey under the best conditions, but behind a dog team, through the wilderness in extreme weather is a daunting challenge. 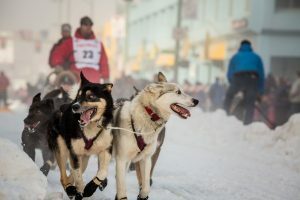 That’s the essence of the Iditarod, bringing together tough human and animal athletes for the yearly race to Nome. We’ll hear stories of past adventure on the trail from former champions and what the future of the race may be on the next Talk of Alaska. LIVE Broadcast: Tuesday, March 5, 2019 at 10:00 a.m. on APRN stations statewide.